SKU: 245. 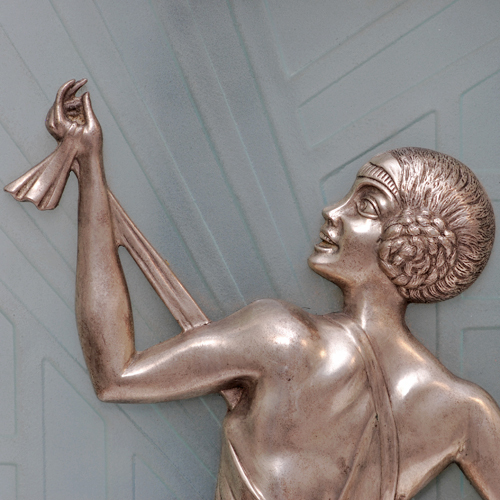 Category: Art Deco, Lighting, Sconces, Sculpture. 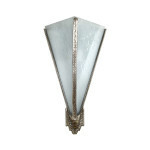 Tags: 1stdibs, antique silver, Art Deco Sconces, Bronze Sconces, dancer sconce, Deco Glass, Etched Glass, gori, gori sconce, Gory, Gory Sconce, Gory Sculpture, lady sconce, LED Lighting, lost wax bronze, Right Left Sconces, Silver Bronze. 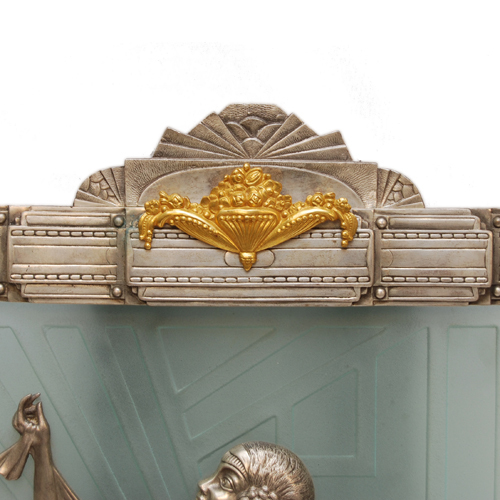 Art Deco Lady Sconces Attributed to Affortunato Gori (Gory). 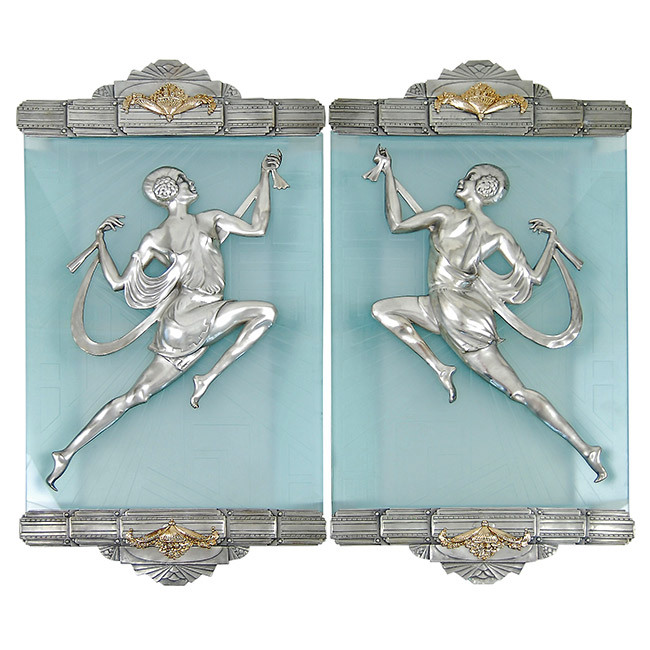 Decorative Art Deco End Caps Cast in Bronze and Finished in Antique Silver. End Caps Decorated with a 5″ Bonze Applique Finished in 24kt Gold Dore. 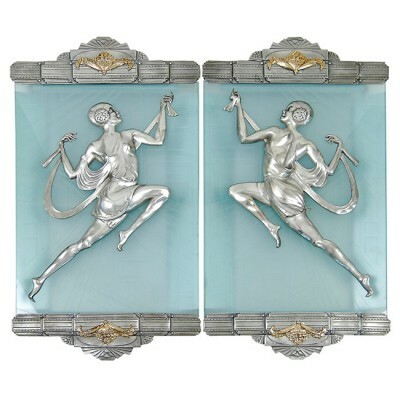 Sconces Depict Prancing Females with Draped Greek Attire (Each With Distinct Flowing Short Dresses), Finished in Antique Silver, and Custom Made Centered on Green Acid-Etched Glass – Etching Done in Classic Art Deco Geometric Shapes. 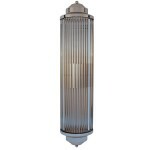 *Lighting is Provided by Custom Manufactured LED Warm-White Light Bars at the Top and Bottom of the Fixture. Improvements to the Original Lighting Concept are Implemented Via Custom Hand-Fabricated Reflectors – Which Provide Focused Lighting and Glass Stabilization. **All Castings Made via Lost Wax Method. These Pieces are Large and Solid at 35LBS Each Side. 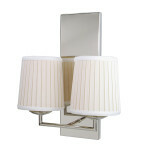 Art Deco Decor Gori Sconces Sold as Matching Left and Right Pairs. *LED Bars: Custom Made for Our Applications; Better Alternative to Lower Quality Tape Light. Our LEDs are Quality Inspected and Warrantied. 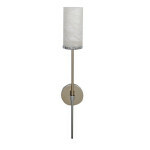 Our LED Lighting is Made to Use Standard US Outlet Voltage with No External Transformers or Humming Needed. **Lost Wax Bronze Casting Ensures: Sharp Details, Ensures Product Will Last a Lifetime, Mimics Original Artist Methods and Leaves Product With Less Surface Blemishes Inherit in Inferior Casting Metals Such as Aluminum, Spelter (Die-Cast) and Low Quality Brass Mixtures.